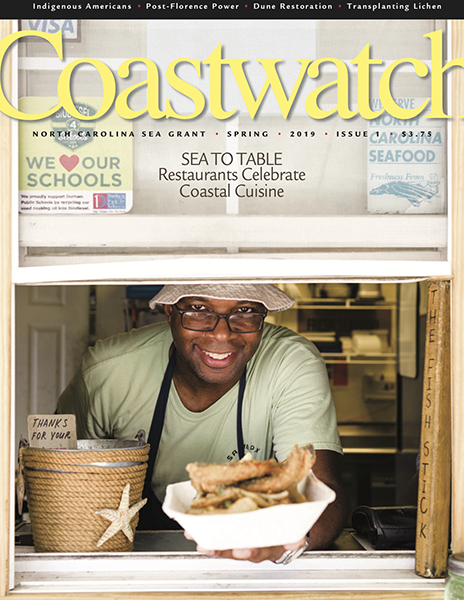 Chef Ricky Moore of Saltbox Seafood Joint. Photo by Baxter Miller. Sea Grant continues to partner with communities as they recover from Hurricane Florence and Tropical Storm Michael. Despite the challenges of bringing North Carolina seafood to inland restaurants, chefs and customers are celebrating coastal cuisine. Peak electric co-op outages hit a record high of more than 300,000 homes — but co-ops mobilized with all hands on deck. A hotspot for lichen biodiversity in northeastern North Carolina faces the threat of rising seas. When an Indian emissary met the English ships in July 1584, things went so well that Wingina decided to try to adopt the strangers. What does it mean to be indigenous and American? Two fisheries specialists bring us the latest from their new blog series. What’s in a Name? A Lot, It Seems! It’s time for a new moniker for our old friend Spartina alterniflora. Florence and Chris wreaked havoc on the Neuse River Estuary. Dee Stribling reflects on the remains of a day.